Jump City’s Pirate Ship Combo 3 in 1 Jump, Rock Wall Climb and Slide! Combo Inflatable Bounce House, Rock Wall and Slide! Ahoy Matey! 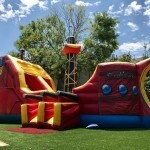 The Pirate ship jump-n-slide combo fits perfectly with any pirate themed party. Resembling an actual pirate ship, this combination jump house is sure to impress guests of any age, even teenagers. This high capacity inflatable contains a jumping area, climbing wall, and a full size slide—perfect for any small or large scale event. 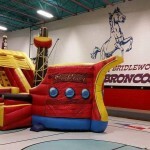 This unique inflatable is 17×37, and will be set up on time, clean, and ready to go in no time by a licensed Jump City team member. Serving the North Dallas, Frisco, Plano, Lewisville, Southlake, and Denton areas.